This material was collected from a powdered coal fired boiler. Flyash is the fused inorganic portion of a fuel. The most common fuel producing flyash is coal. The flyash from coal is the result of the conversion of incombustible minerals associated with the coal into a glassy phase or chemical conversion of the mineral into a more thermally stable compound. Examples include the conversion of calcium carbonate into frothy calcium oxide spheres or quartz into a glass sphere of silicon dioxide. The combustion of coal is not the only source of flyash. It can be produced by any efficient combustion process where the fuel contains small incombustible materials. A hog-fuel boiler may produce flyash from glass fiber that may have been introduced along with the fuel. The only requirements for the production of flyash are that a temperature sufficient to melt the incombustible material is attained and the material is in the combustion zone for a long enough period of time to melt. Flyash generally indicates a controlled combustion source in the area. 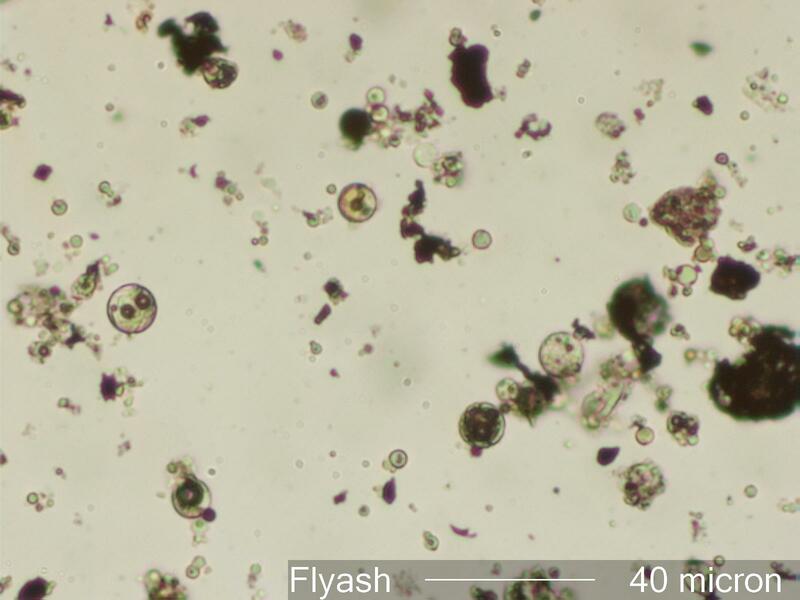 Flyash is generally round or at least "rounded" as a result of being exposed to high temperatures under controlled conditions. The particles are generally isotropic though they may recrystallize as they cool. They have a smooth, glassy surface though the surface may be "warty" or blistered depending on the precursor material. Refractive indices may range from 1.48 or rarely even lower to over 2.0. Typically the refractive index exceeds 1.51. The particles may vary from transparent to opaque and from colorless to yellow, green, orange, red, or black. They may contain bubbles or other inclusions. They may even be frothy if sufficient gases were released during the melting process. Gas bubbles in the spheres are a clue to the type of mineral represented. Frothy spheres are characteristic of carbonates. A few bubbles are typical of clays. Feldspars, quartz, and other oxides tend to form spheres with no inclusions. The color is generally an indication of the amount a valence state of iron in the precursor material. Fugitive coal particles are associated with a coal fired boiler.